It’s time for Sew Saturday Snippets #11! This series is all about highlighting cool makes, sewing community challenges, contests, and sewing videos. Check out all the previous Snippets in the navigation bar above or here! If you’re interested in being featured on an upcoming edition of Sew Saturday Snippets, please email me at elizabethmadethis@gmail.com. There’s two days left to submit your pictures for the #dayandnightdresschallenge, so today’s Sew Saturday Snippets is all about sharing some of the wonderful entries that have popped up on Instagram. If you’re sewing here at the last minute, let this fuel your creativity! What’s next for you after The Day and Night Dress Challenge? Want to let more people know about Sew Saturday Snippets? Feel free to share the image below! Katie of Book and Needle interprets the coffee and cocktails theme so perfectly! I love the comfy stripes with Converse, and the cowl on this evergreen dress is such a lovely detail on a cocktail dress! I was positively floored when I saw ellenhatteland in her colorblocked dresses. It’s always a bit of a tango keeping colorblocked designs looking balanced yet have that compelling contrast. I know of few who handle that so well as Ellen, plus her colorblocked designs always involve extremely intricate shapes that really showcase her sewing prowess. Faith‘s dresses are another beautiful study in contrast. The bright spring African print of her day dress is such a fantastic foil against the sleek sequin knit cocktail dress. I love that the day dress pattern started out life as a peplum top. What a great pattern hack! Lo of memadelo takes Deer and Doe’s Givre tee dress and makes 2 completely different looks. The bright happy contrast of the coffee dress transitions into a polished cocktails look capped off with dotted netting. Do you have to do a double take to realize that it’s the same pattern? Me too! Ruchi of eye.stitch uses her pattern drafting skills and makes two fun looks. The play on the stripes is really striking, and the red dress is so classic in its form! While I love both my coffee and cocktails dresses, the lace cocktail dress hits all the points for me combining lace, pattern hacking, my favorite colors, and diy elements. So much of my February has been devoted to making the #dayandnightdresschallenge as cool as it could be for everyone. Being able to make this dress that I’ve wanted to make now for nearly a year felt very personal to me, and I couldn’t be happier with how it turned out. The Clothes Making Mavens podcast talks to several different organizers of sewing challenges. I even manage to be coherent and semi-articulate talking about The Day and Night Dress Challenge. After a challenging Rumana coat, SewMyStyle is springing forward in March with the Closet Case Files Kalle shirt dress. In honor of The Oscars, Patternreview is hosting The Red Carpet Outfit Contest. I’m curious about two things: how many sequins will show up, and how many collective yards of fabric this will entail. This should be good! I have to do some intense work on Excel to determine the winners of The Day and Night Dress Challenge. I truly can’t wait to announce all the fantastic prizes! The Fold Line reviews Sew Your Own Activewear by Melissa Fehr of Fehr Trade. Evelyn Wood talks sewing terminology. 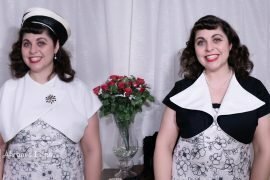 I show you how to pleat with a fork while I talk about my dresses for The Day and Night Dress Challenge. Peggy Sagers talks about how to get your leather projects looking sharp. Katie of Sew Old Fashioned goes podcasty! Thank you for the feature. I really enjoyed this challenge. Everyone did such a great job on their looks. Great roundup, Elizabeth! Lots of inspiring makes. Really enjoyed the event! I was so inspired these projects. Thank you again Elizabeth!! !